The only way I can think to explain how it got there is that I selected it as a keeper at first selection, it was moved into the fry growing on tank. It must have found it's way into the bottom drain and swam along the waste pipe and into the drum filter. I have 3 tanks connected to the same drum filter, so it must have swam back up the waste pipe for the green vortex tank and has been living there. I closed the valve isolating the vortex tank as soon as I saw the litte kohaku and then it was a waiting game with the net. 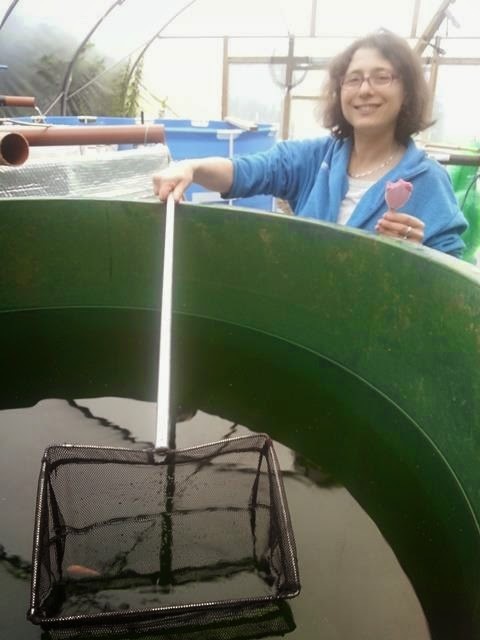 I'd been working on the brood fish tanks, so to avoid cross contamination Amanda did the honours - and I'm glad we did! It has some promise, and may end up with a pleasing pattern. Just hope it doesnt get eaten now it's back in the fry growing on tank with the larger keepers. I'll keep an eye out for it at second selection and let you know how it gets on. The kohaku's are ready for that second selection now, and the only thing stopping me is time! I am very busy right now and focussed on getting another successful spawning. But, it's proving hard this year. I still have the two showa females, another kohaku and another shiro - which I picked up recently which are prospects for next year but may have sufficient eggs to have a go with them this year. 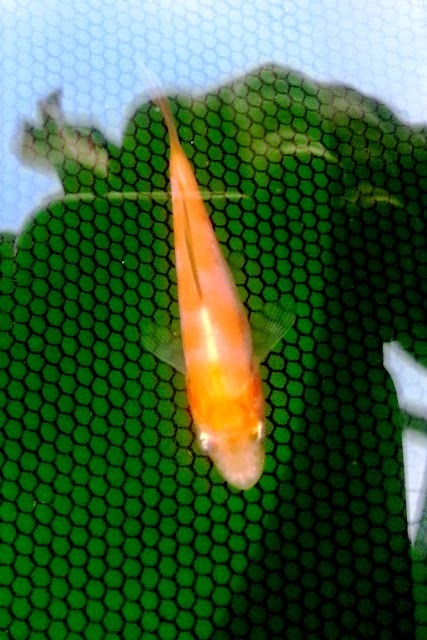 I've also collected another male kohaku. I am also beefing up the biological filter on the females tank, and there are more ducks to deal with on the fry ponds. I honestly don't know how they're getting in, but it's a right pain! And... there's duck weed to remove from the other fry pond.